Four residues in cytoplasmic loop e were essential for substrate hydrolysis and ...... H+-pyrophosphatase: necessity of Cys634 for inhibition by maleimides. USA. Vol. 89, pp. 4564-4568 May 1992. Biochemistry. 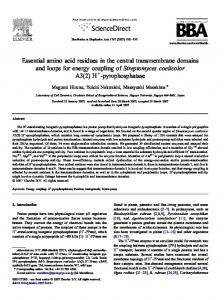 Amino acid substitutions in the sixth transmembrane domain of. 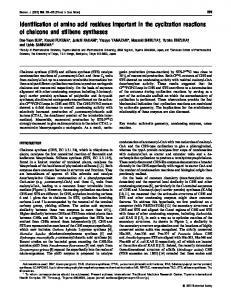 P-glycoprotein alter multidrug resistance. E35D mutant; lane 4, E52Q; lane 5, E52D; lane 6, E59D; lane 7, E89K; lane 8,. E89D ... Trudi Bannam, Paul Crellin, Priscilla Johanesen, and Joanne Johnston. 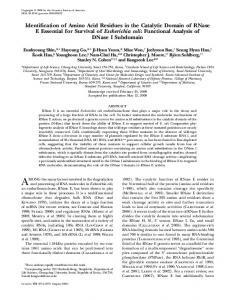 Jun 3, 2005 - within domain VI of the VSV L protein are essential for mRNA cap methylation. 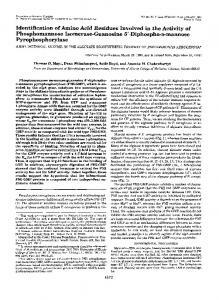 ...... dephosphorylated and the 4E binding protein (4E-BP1) is ac- ..... Schnitzlein, W. M., M. K. O'Banion, M. K. Poirot, and M. E. Reichmann. 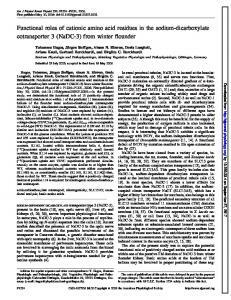 1983.
heparin-binding domains of factor H and its closest homologues, molecular ..... The individual SCR domains from the two available NMR structures (1HFH. short linkers of three to eight residues, arranged in a head-to-tail fashion, resembling a ..... T.K. Blackmore, T.A. Sadlon, H.M. Ward, D.M. Lublin and D.L. Gordon,. Communicated by Robert J. Shepherd, September 23, 1991. ABSTRACT. The virulent ... TCV-B (Berke- ley isolate, kindly provided by T. J. Morris and L. Heaton,. Nov 12, 2015 - transmembrane domain identified seven critical amino acid residues within the .... structure of OATP1B1 was modeled with the web-based protein structure ..... The Supporting Information is available free of charge on the. were conﬁrmed by full length sequencing (Invitrogen, Carlsbad, CA). Cell Culture and Transfection of Plasmid Constructs into Cells. HEK293 cells were grown at 37 °C and 5% CO2 in Dulbecco’s modiﬁed Eagle’s medium (Invitrogen) supplemented with 10% fetal bovine serum. Conﬂuent cells in 48well or 6-well plate were transfected with DNA plasmid using LipofectAMINE 2000 reagent (Invitrogen) following manufacturer’s instruction. Transfected cells were incubated for 48 h at 37 °C and then used for transport assay or cell surface biotinylation. Uptake Assay. Cells in 48-well plate were used for transport measurement as described previously13 with minor modiﬁcation. Brieﬂy, cells were incubated with uptake solution containing [3H]ES or [3H] taurocholic acid at 37 °C for 2 min (1 min for kinetic analysis) and uptake was stopped by ice-cold phosphate-buﬀered saline (PBS) solution. Cells were then washed with cold PBS, solubilized in 0.2 N NaOH, and neutralized with 0.2 N HCl. Radioactivity of the cell lysate was measured with a liquid scintillation counter Triathler-Hidex (Hidex, Finland). The uptake count was standardized by the amount of protein in each well. Cell Surface Biotinylation and Western Blotting. Cell surface expression level of OATP1B1 and their mutants were examined using the membrane-impermeable biotinylation reagent NHS-SS-biotin as described previously.13 Brieﬂy, HEK293 cells expressing OATP1B1 or mutants were labeled with NHS-SS-biotin (0.5 mg/mL in PBS). The cells were then dissolved with RIPA buﬀer (50 mM Tris, 150 mM NaCl, 0.1% SDS, 1% NP-40, protease inhibitors phenylmethylsulfonyl ﬂuoride, 200 μg/mL, leupeptin, 3 μg/mL, pH 7.4), and proteins in supernatant were collected after centrifugation. Streptavidin-agarose beads were added to bind the biotinlabeled membrane proteins. The streptavidin-agarose beads bound proteins were ﬁnally released in 4× Laemmli buﬀer and loaded onto a 7.5% SDS-polyacrylamide electrophoresis gel, then transferred electrophoretically to a polyvinylidene diﬂuoride membrane (Millipore, Billerica, MA) and detected with anti-HA antibody (Cell Signaling Technology, Danvers, MA). Statistical Analysis. 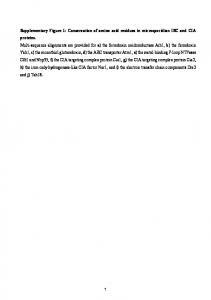 Statistical analysis of experimental data was carried out using Student’s t test. 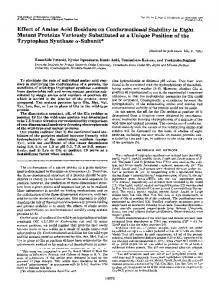 Diﬀerences between means are regarded as signiﬁcant if p < 0.05. Figure 1. Position of TM11 relative to TM2 in putative computer model of OATP1B1. Viewed from the extracellular side (A) and the intracellular side (B). Glycerol-3-phosphate transporter (PDB 1pw4) was used as the template for homology modeling of OATP1B1. The structure of OATP1B1 was modeled with the web-based protein structure prediction service Phyre2 (http://www.imperial.ac.uk/ phyre/). Arrows indicate positions of TM11 and TM2. TMs might coordinate with each other for OATP1B1 uptake function. In addition, R580, a positively charged amino acid that is located within TM11, has been demonstrated to be important for substrate interaction of OATP1B1.16 In the present study, we performed alanine-scanning to study the TM11 of OATP1B1. 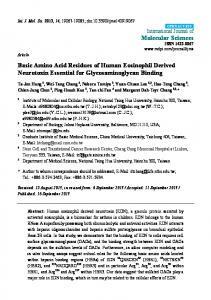 Alanine substitution of seven amino acids, including R580, showed more than 50% decreased in uptake function as compared to wild-type OATP1B1. Further studies revealed that cell surface expression of most alanine mutants decreased dramatically, but conservative replacement partially recovered expression and uptake function of F591, I595, and D596. Kinetic analysis of the functional impaired mutants was also carried out. Figure 2. Putative transmembrane domain 11 of human organic anion transporting polypeptide family members. Amino acid residues located within TM11 were predicted according to Kyte−Doolittle hydrophobicity scale. Multiple sequence alignment of 11 OATP family members was performed with Clustal W. Only partial sequences are shown here. The corresponding sequences of TM11 are in bold. Figure 3. Estrone-3-sulfate uptake by OATP1B1 transmembrane domain 11 mutants. Uptake of 50 nM ES by HEK293 cells expressing OATP1B1 and its alanine-substituted mutants was measured at 37 °C at a 2 min interval. Net uptake was obtained by subtracting the uptake of cells transfected with empty vector from cells expressing wild-type OATP1B1 or mutants. The results represent data from three experiments, each with duplicate measurements for OATP1B1 and mutants. The results shown are means ± SE (n = 3). The dashed line indicated 50% of ES uptake by OATP1B1 wild-type. Figure 4. Protein expression of mutants with signiﬁcantly reduced uptake function. 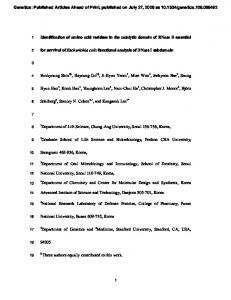 (A) Representative blot for cell surface level analysis of OATP1B1 and mutants. (B) Cell surface expression of OATP1B1 and mutants. The intensity of protein bands relative to the wild-type was quantiﬁed with ImageJ (http://imagej.nih.gov/ij, National Institute of Health, USA). The results shown are means ± SE (n = 3). 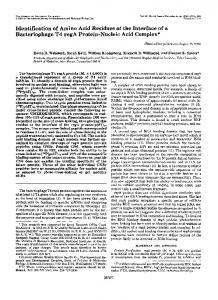 Cells were biotinylated, and the biotin-labeled cell surface proteins were precipitated with streptavidin beads, separated by SDS-PAGE, followed by Western blotting with anti-HA antibody. Same blot was probed with integrin antibody as surface protein loading control. (C) Total protein expression of OATP1B1 and mutants. Cells were lysed with RIPA buﬀer, separated by SDS-PAGE, followed by Western blotting with anti-HA antibody. The band intensity relative to the wildtype was quantiﬁed with ImageJ. The results shown are means ± SE (n = 3). Moreover, cell surface expression of G584 V and G592P/V was much reduced even compared with their respective alanine mutants (Figure 6B). Substitution of P588 with glycine, however, slightly increased cell surface expression level and uptake function of the transporter protein. As for F591, I595, and D596, when they were replaced with amino acid residues that have similar side chain structures, ES uptake function was partially recovered, with the exception of D596N (Figure 7A). Figure 5. Proteosome and lysosome inhibitor treatments of mutants with signiﬁcantly reduced protein expression. (A) Total protein expression of OATP1B1 and mutants after treated with MG132 or NH4Cl. (B) Cell surface expression of OATP1B1 and mutants after treated with inhibitors. Cells expressing OATP1B1 and mutants were treated with 20 μM MG132 or 5 μM NH4Cl for 12 h, and total and cell surface proteins were isolated and detected with anti-HA antibody as described in Figure 4. The immature (72 kD) and mature form (95 kD) of OATP1B1 were indicated by arrows. isoleucine with alanine at this position not only accelerates degradation but aﬀects cell membrane targeting of the protein as well. ES Uptake Function of Additional Mutants. To further investigate whether the side chain structure of these critical amino acids is essential for OATP1B1 function, we substituted these residues with additional amino acids. G584 and G592 were replaced with proline, a residue that may also aid to form a “kink” structure in the protein as glycine but with much larger side group. Since glycine has a small side chain (a hydrogen atom), the replacement of these glycines with alanine, which has a methyl side group, may block substrate translocation. We therefore generated valine (with slightly larger side group than alanine) mutants of G584 and G592 as well to see if the side chain size of G584 and G592 is important for uptake function of the transporter. As shown in Figure 6A, these additional substitutions resulted in further reduction of ES uptake. Figure 7. Additional replacement of other functional impaired mutants. (A) ES uptake of OATP1B1 and additional mutants. Uptake of 50 nM ES was measured at 37 °C at a 2 min interval. The results represent data from three experiments, each with duplicate measurements for OATP1B1 and mutants. The results shown are means ± SE (n = 3). (B) Cell surface expression of additional mutants. Biotin labeling and protein analysis were carried out as described in Figure 4A. OATP1B1 was reported to have two binding sites for ES,9,12,18 uptake of ES was therefore measured at concentrations ranged from 0.01 to 20 μM for OATP1B1 wild-type and mutants at 37 °C at a 1 min interval and corrected for cell surface expression. All mutants retained a biphasic kinetics for ES and hence showed two Km and Vmax values. Transport kinetic parameters were calculated using the Eadie− Hofstee transformation. The results shown are means ± SE (n = 3). Asterisks indicate values signiﬁcantly diﬀerent (p < 0.05) from that of OATP1B1 wild-type. Uptake of taurocholate was measured at concentrations ranging from 0.5 to 50 μM for OATP1B1 wild-type and mutants at 37 °C at a 1 min interval and corrected for cell surface expression. Transport kinetic parameters were calculated using the Eadie−Hofstee transformation. The results shown are means ± SE (n = 3). Asterisks indicate values signiﬁcantly diﬀerent (p < 0.05) from that of OATP1B1 wild-type. was signiﬁcantly increased, while that of P588A, G592A, I595A, and D596A remained unchanged. Vmax of most of the mutants was greatly increased or similar to that of wild-type OATP1B1 except G584A, which exhibited a signiﬁcantly decreased value of Vmax. 10 out of 11 being an asparatic acid and a glutamic acid in OATP6A1. Our study demonstrated that the negative charge at this location is critical because though substitution of D596 with glutamic acid did not recover its cell surface expression, it signiﬁcantly increased ES uptake by the transporter. However, when D596 was replaced by asparagine, cell surface expression was dramatically increased, while transport function was still lacking. These suggested that the charged property of D596 is essential for substrate transport, while its side group structure may be important for its stability. It is interesting that negatively charged residues shall play such a critical role in substrate interaction because OATP family members mostly transport anions. D596, as well as D70 and E74 in TM2,13 are localized at the extracellular side of the transporter and thus may play a role for the entry of substrates into the binding pocket, possibly by maintaining a proper structure of the transporter. 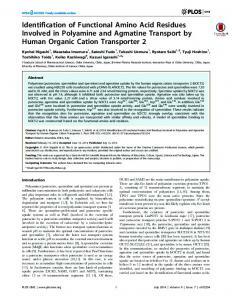 However, further studies are needed to clarify such an issue in the transport function of OATP1B1. Another interesting ﬁnding was that D596E as well as G592A showed dramatically increased Vmax value in addition to a signiﬁcantly elevated Km for the low binding component of ES transport. In addition, these two mutants exhibited higher uptake for high concentrations of ES (data not shown). The simultaneous increase of Km and Vmax was also reported in human copper transporter 1 (hCTR1), in which mutation of the positively charged H139 in TM2 to arginine caused a dramatic increase in both Km and Vmax values.20 The presence of an arginine residue at this position, which resulted in diﬀerent protonation status compared with a histidine, may aﬀect conformation of hCTR1 and facilitate faster transit of copper ions through the permeation pathway.21,22 In our study, the conversion of the negatively charged D596 to a glutamic acid that has a larger side group and substitution of G592 with alanine may similarly change the conformation of OATP1B1 and facilitate the transit of ES through the transport pore. It thus implicated that the rate-limiting interaction for high concentrations ES uptake may take place at these locations. In summary, we identiﬁed six critical amino acid residues in addition to R580 within the structure of TM11 of OATP1B1. 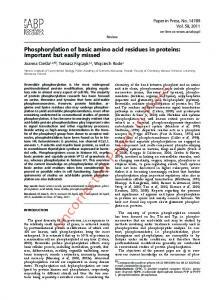 Most of these residues are important for both substrate interaction and stability of the transporter protein. R580 and I595 may also play a role in targeting OATP1B1 to the plasma membrane (Table 3). 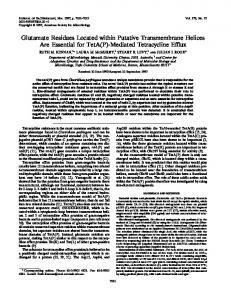 Report "Amino Acid Residues in the Putative Transmembrane Domain 11 of ..."